Albert was born in Leeds, Yorkshire, in the December quarter 1898, the second son of John William (Fruiterer) and Ada (née Watson) Rogers. Albert had three older sisters, Ada, Edith and Lydia, and an older brother, William Henry. [See: Footnote below] The family were living at 53 Compton Row, Potter Newton, Leeds in 1901 (Census RG 13/4251). In 1911 (Census RG 14/21373) the family had moved to 7 Higher Hillgate, Stockport, Cheshire. However, five years later the 1916 Kelly's Directory for Buxton has an entry for "J. William Rogers and Son - Fruiterers", so clearly the family had moved to set up a new business, and perhaps Albert was employed in the family business. CWGC Records show that after the War Albert's parents were living at 9 South Avenue, Buxton. According to the SDGW database Albert enlisted in Chester. His Medal Index Card (MIC) gives no indication when he entered the War, usually indicating it was after 31st December 1915, as he did not qualify for the 1914 - 15 Star. Unfortunately, like so many others, Albert's Service Papers were lost in September 1940, when a German bombing raid struck the War Office repository, so is difficult to determine when his transfer from the Kings Own Scottish Borderers to The Seaforth Highlanders took place. Comparison with other Service Numbers, however, would indicate that Albert enlisted in the Kings Own Scottish Borderers in late September 1915. Similarly, a transfer to the Seaforth Highlanders towards the end of 1916/early 1917 seems the most likely. "The chaplain wrote that a shell landed right on the spot and killed six men outright, of whom the deceased was one. He was buried with his comrades near the village [Rouex] east of Arras and a cross had been erected over his grave." The 1/6th (Morayshire) Battalion of the Seaforth Highlanders had been formed in August 1914 at Elgin as part of Seaforth and Cameron Brigade in the Highland Division. It then moved to Bedford. On the 2nd May 1915 the Battalion landed in France and 10 days later the Brigade became the 152nd Brigade in 51st (Highland) Division. The Highland Division was a formation of the Territorial Force, formed as a result of the reforms of the army carried out in 1908 under the Secretary of State for War, Richard Burdon Haldane and was one of 14 Divisions of the peacetime Territorial Force. 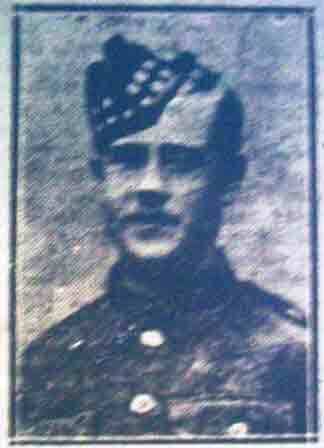 However, the 1/6th Battalion did not serve in Egypt, so, as reported in 'The Advertiser', Albert did fight there it must have been with his first Regiment, the Kings Own Scottish Borderers. None of the usual sources tell us which Battalion he served with, but the 1st, 1/4th and 1/5th Battalions all fought in Gallipoli in 1915, before being evacuated to Egypt in January 1916. On the 17th April 1918 they moved with their Divisions and landed at Marseilles for service in France. At some time between the two dates of being posted to France and his death in August 1918, Albert transferred to the Seaforths - probably about the end of 1916. During The Battle of the Scarpe, a phase of the Second Battles of Arras 1918, he was killed in action. On the 26th August 1918, the Highland Division attacked near Arras and had five successive days of fighting in which it captured the strong points at Roeux, Greenland Hill and Plouvain. On the last day of the Battle, 31st August, Albert died in the manner described above in 'The Buxton Advertiser'. 24 others of his Battalion were killed in that period, 8 on the same day. All but five are buried alongside Albert. Albert was probably originally buried in SEAFORTH CEMETERY, ROEUX, on the North-East side of the road from the village to the station, where 18 soldiers from the United Kingdom were buried in April 1917, and 21 of the 6th Seaforths in August and September 1918. Plot VI where Albert lies in Browns Copse Cemetery was one of the four plots made after the Armistice when 850 graves were brought in from the area north and east of Arras. All six of the men of the Seaforth Highlanders, killed by the shell on the 31st August 1918, now lie together in Plots VI and VIII of Browns Copse Cemetery. · Albert's older brother, William Henry ROGERS, served during the War with the Royal Navy.